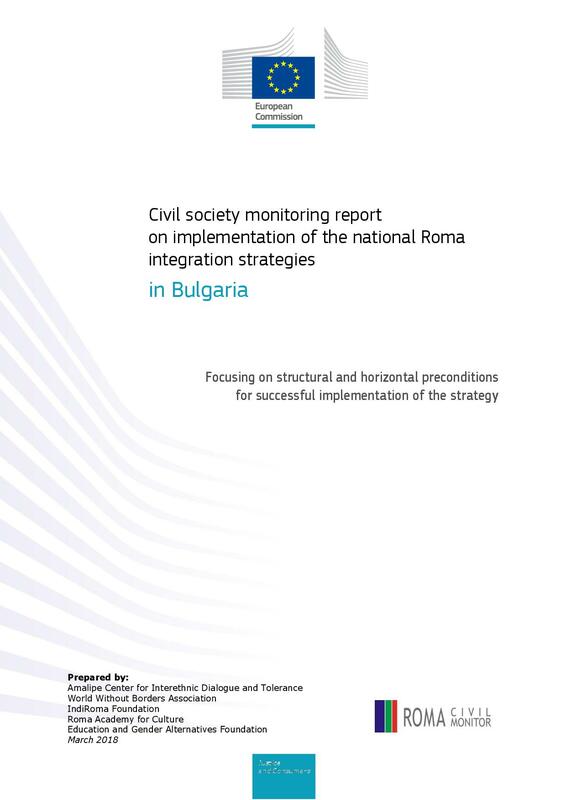 The Civil society monitoring report on implementation of the national Roma integration strategies in Bulgaria. Focused on the structural and horizontal prerequisites for successful implementation of the strategy is already available in Bulgarian. • Local research in Plovdiv - Rada Elenkova (Gender Alternatives Foundation). External experts were included as reviewers, namely Assoc. Prof. Dr. Yosif Nunev and Lalo Kamenov. The overall development of the report is coordinated by Amalipe Center. The report was prepared in the framework of the Capacity building for Roma civil society and strengthening its involvement in the monitoring of national Roma integration strategies Pilot Project. The pilot project is carried out by the European Commission, DG Justice and Consumers. It is coordinated by the Center for Policy Studies of the Central European University, in partnership with the ERGO Network, the European Roma Rights Center, the Secretariado Gitano Foundation, the Roma Education Fund and is run by around 90 non-governmental organizations and experts from 27 Member States.